Erik Prince, the owner of a series of mercenary firms originally known as Blackwater, wants to “privatize” the war in Afghanistan. And he wants you to pay him to do it. Ultimately, of course, whether or not Prince’s plan accomplishes the government’s objectives in Afghanistan — objectives that remain murky and ever-changing to this day — it’s a win-win for Prince. He’ll get billions in revenue out of the deal no matter what. Of course, when we use the word “privatize” in this context, we don’t really mean anything of the sort. Prince’s plan would be “privatization” in the same way that a city government might privatize road building. The government hires a private firm to perform the services — but it’s all paid for with taxpayer money. Privatization may have some advantages. In the case of road building, privatization means the government no longer has to maintain and store its own equipment. Of course, whatever fees a government pays for the roads will have to cover the firm’s costs of storing and maintaining its own equipment. At least in the case of road building it’s fairly easy to see if services have been performed. Even then, it’s hard to know how long, or how well, the road will last. Determining whether or not services have been competently rendered in Afghanistan is something far harder to evaluate. This brings us to the second way in which “privatization” has nothing to do with a truly private sector. All else being equal, it’s potentially the case, that the plan could decrease government spending. Unfortunately, there are numerous complicating factors that must also be considered. 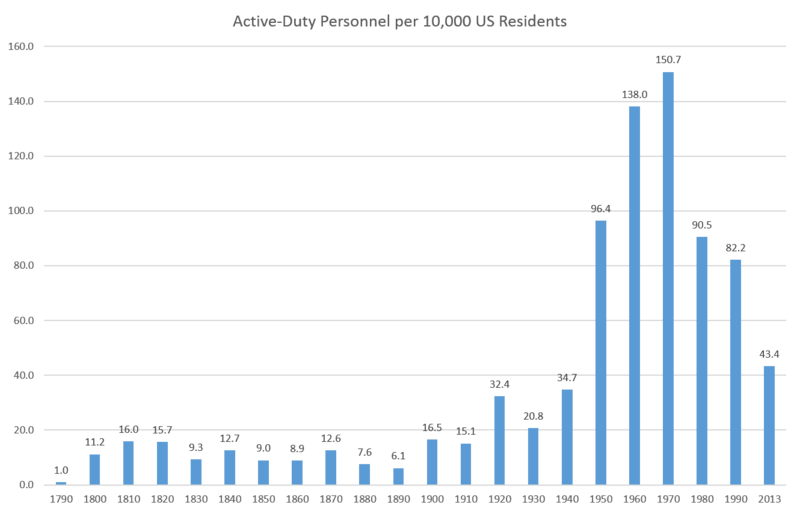 Even with these steep drops, of course, the US still has a much larger permanent federal military than would ever have been tolerated prior to the Civil War. Given the tiny troop totals funded by the US government in that period, historian Marcus Cunliffe concludes that, as late as the 1840s, “Americans in many areas had no idea what a regular officer looked like.” By “regular” Cunliffe means a professional soldier employed by the federal government. Many Americans were familiar with the militias at the time.3 But federal soldiers were a rare oddity. Military, spending, however, did not decline. When adjusted for inflation, military spending since 2004 has been above or near Cold-War-Reagan-Era levels . 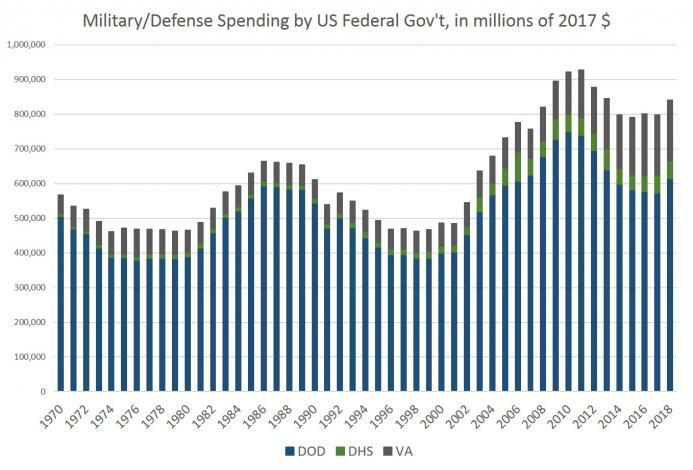 If spending on veterans and “Homeland Security” is included — as it should be — then spending levels are now well above what they were during the Cold War. Part of the money, of course, is used to fund what might be called “labor-saving devices” in a military context. That is, capital and cash can be used to design, purchase, and deploy vehicles, weapons, and devices that can deliver the same amount of destructive power equal to what once required a sizable number of soldiers. In other words — as with many other endeavors — machinery can be substituted for personnel. But this can’t always be done, and that’s where the paid mercenary “contractors” come in. Contractors also encourage mission creep, because contractors don’t count as “boots on the ground.” Congress does not consider them to be troops, and therefore contractors do not count against troop-level caps in places like Iraq. The U.S. government does not track contractor numbers in war zones. As a result, the government can put more people on the ground than it reports to the American people, encouraging mission creep and rendering contractors virtually invisible. For decades now, the centrality of contracting in American warfare — both on the battlefield and in support of those on the battlefield — has been growing. During World War II, about 10 percent of America’s armed forces were contracted. During the wars in Iraq and Afghanistan, that proportion leapt to 50 percent. … Today, 75 percent of U.S. forces in Afghanistan are contracted. Only about 10 percent of these contractors are armed, but this matters not. The greater point is that America is waging a war largely via contractors, and U.S. combat forces would be impotent without them. If this trend continues, we might see 80 or 90 percent of the force contracted in future wars. It’s easy to see how all this makes things easier for American politicians. With a military strategy so reliant on people other than US soldiers, politicians can reward their friends and donors with ever increasing levels of military spending. They can keep any number of splendid little wars going, and the voters will rarely hear about any troop casualties or “boots on the ground.” The lack of American troops on the ground in Syria, or Yemen, or Afghanistan allows politicians to claim that the military operations are being “phased out,” or “wound down.” In reality, the money keeps flowing, and the bombs keep flying. Thus, in determining whether it’s a good idea to double down on the use of military contractors, as Erik Prince would have us do, it needs to be more than a decision about spending levels. Relying more and more on contractors is essentially a political strategy designed to make it easier to hide information about Americans foreign policy from voters. Another consideration is one of American civil liberties. In the eighteenth and nineteenth centuries, American political ideology inveighed heavily against the existence of a federally-controlled standing army. The fear was that a sizable force of ground troops could be used to violently impose government policy on the US population. This fear of standing armies was the primary motivation behind the Second Amendment and general political opposition to a well-funded military establishment. In two essays here at mises.org devoted to this issue, I pointed out that calling for a large and powerful military was in conflict with the Second Amendment as imagined by the people who wrote it. In response, many commenters in social media and here at the site claimed that the military will never be a threat to US citizens because “they take an oath to uphold the constitution.” This in itself is an extremely naïve statement, of course. But even if it weren’t naïve, would the same claims about a devotion to an oath about the US Constitution apply to combat-experienced soldiers employed as contractors? It seems unlikely. Naturally, it would be illegal for the US government to use such personnel against US residents in the US. But in times of crisis and strife, the fact something is illegal has never been much of a hindrance to the US government. It doesn’t require the world’s most active imagination to imagine an American future in which military contractors are employed to “restore law and order” to a turbulent political situation. Politicians Picking Winners and Losers/ What Could Possibly Go Wrong?